In an attempt to get my Mum to stop snacking on bad treats, I have tried to cram all her favourite flavours into one healthier and delicious ball. After a few attempts, I finally achieved the right balance of sweet and savoury for her and she loves them! They're a great pick-me-up in between main meals and can be made in batches and kept in the freezer. 1. In a small bowl whisk together the peanut butter, honey and ginger. 2. Mix together the remainder of the ingredients in a separate large bowl. 3. Add the wet ingredients to the dry ingredients and mix thoroughly with a spoon or your hands until the mixture is slightly sticky. 4. Take a chunk of the mixture and roll it into a ball with your hands. These should be roughly the size of a golf ball. 5. 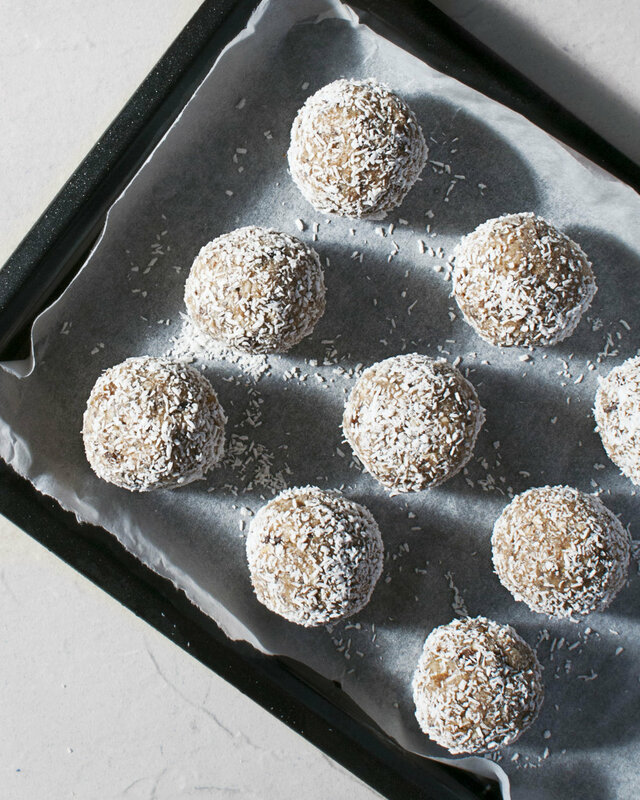 Sprinkle some of the desiccated coconut onto a small plate and roll each ball into the coconut so it covers the ball. 6. Place the balls onto a tray and freeze. These can be taken out of the freezer an hour before eating.